It is currently 9:48 pm and I have been putting this off all day. Let me explain why. A few weeks ago, I got a package in the mail including this. Water. Nice! I like water! Food Grade Redmond Clay. Wait. What? Xylitol. I think that's fake sugar? Maybe? Peppermint Essential Oil. Okay, I like that, no problem. Redmond Real Salt. Wait, SALT? Tea Tree Oil. I give up. And I'm supposed to put this in my mouth. On purpose. So join me in the festive journey of using Earthpaste for the first time. Let's first look at the package and learn a little about Earthpaste, mostly because I'm putting off using this as long as possible. "You may ask, why the name Earthpaste? It's a simple answer, really. All the ingredients in Earthpaste are from the earth. Earthpaste won't be what you're used to because it is completely natural with very few ingredients. We don't add titanium dioxide to make it white, nor do we add any foaming agents. 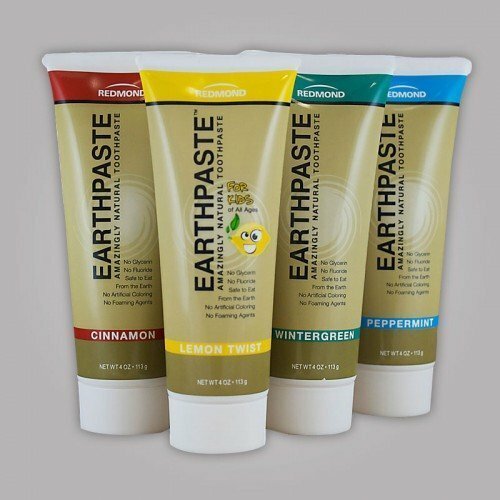 Earthpaste is natural in color - it's how toothpaste should be. We keep it real." Wow. Okay, let's do this thing. Of course, this product was sent to me free of charge with the knowledge that I would give it my unbiased opinion. Upon inspection, Earthpaste has the look and consistency of baby poop. It smells strongly of peppermint, which is nice, and has to be shaken in the tube to get the proper mixture of ingredients. Otherwise you squeeze the tube and a big blob of water comes out. Not nice. Once mixed thoroughly, it looks like this. Ewwwwwwww. Okay, so here goes. The taste is very pleasant if you like peppermint with tea tree undertones, which I do. It does not foam up, so be sure to wet the brush before using. It's a bit rough on the gums (mine actually bled a little) but the entire experience was not bad at all. And when all was said and done, my mouth felt very clean indeed. So to sum up: Earthpaste is a fine product, if you get over the fact that you're scrubbing your teeth with clay, and if you don't look at it too closely, because it really does look like baby poo. My teeth feel nice and fresh, and not caked with dirt in the slightest, which was what I was afraid of. Were my fears silly? Absolutely. Would I buy this product? Probably not, only because I have very sensitive gums, and like I said before, it was pretty rough on them. All in all, this was a learning experience that showed me that you cannot judge a clay toothpaste from its cover. Live and learn, people. Live and learn. Earthpaste is available at www.earthpaste.com.